Coffee Spots which also sell equipment such as grinders, kettles, scales and home espresso machines. Is it a coffee shop? Show room? Retailer? Actually, Dispatch Coffee is all of these and more. It’s also a coffee truck, or it was. When I first came to Montréal in 2013, several people mentioned a coffee truck (Dispatch), but I didn’t have time to visit. Fast forward 5½ years and Dispatch has a roastery/café in Mile End, a coffee counter at McGill University and a beautiful coffee shop/showroom on Boulevard Saint Laurent, the subject of today’s Coffee Spot. Dispatch roasts its own coffee, all single-origins, at its Mile End location, emphasising fresh, seasonal coffee, all available to buy in-store. When I visited, there were six different origins, one of which was a decaf. One of these, plus the decaf, is available as espresso, another as batch-brew and any of them can be had through the Aeropress. The espresso and batch-brew options change regularly, the staff putting on two or three bags at a time, then moving on when they’re done. This means that they can easily have two different espressos on each day, although the batch-brew changes more slowly, maybe just once a day. There’s also a small selection of cakes, pastries and pre-prepared salads if you’re hungry. 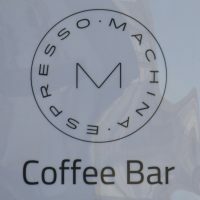 Machina Espresso started life in Lock-up Coffee, a city-centre, weekend pop-up run by Ben Wylie, a barista at the late, much lamented Freemans Coffee. Back then, Machina Espresso was just an equipment supplier, but in November last year it moved into its current premises to become a fully-fledged coffee shop. 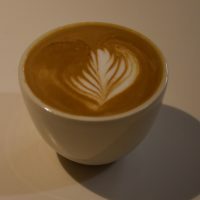 The equipment is still here: (very) shiny espresso machines from Rocket and Expobar; compact grinders, great cups, tampers, pouring kettles… Everything, in fact, that you need to make great coffee at home.